Satellite image acquisitions will be synchronised with the tides as part of an ambitious new project to map coastlines from space. Formally beginning in September, ESA's COASTCHART project aims to develop and qualify a specialised coastline information system that provides satellite-derived coastal data products suitable for operational use by hydrographic organisations. Accurate up-to-date marine charts are essential for safe shipping navigation. They also increasingly serve as management tools for coastal zones â€“ areas that are economically and environmentally important as sites of harbours, fisheries, oil and gas fields, tourism sites, wildlife habitats and home to the majority of the human race. National hydrographic organisations, as co-ordinated by the International Hydrographic Organisation (IHO), have the global task of mapping the sea and also the 'littoral' - that is, the stretch of shore affected by the sea. Their work is based on surveying campaigns using ships and air-based platforms Updates may also be provided by shore-based authorities or those working in the near shore waters. However the world has around 860000 km of total coastline, and coasts are always changing: sand and mud banks have been known to shift hundreds of metres during a single year. Aerial surveying can cover hundreds of kilometres in a day, but is costly and can only be performed if weather conditions are right. Both tropical and polar coasts may stay enshrouded in cloud and precipitation for weeks or months at a time. Radar sensors such as the Advanced Synthetic Aperture Radar (ASAR) aboard ESA's Envisat can penetrate cloud cover as well as local darkness. They work on the basis of detecting reflected radar pulses to measure surface roughness. "The textures of land and sea surfaces are quite different, so radar imagery shows up coastlines very well in most cases," said Professor Jean-Paul Rudant of the UniversitÃ© de Marne La VallÃ©e in Paris, a pioneer of the use of radar imagery for coastal mapping and scientific advisor to the COASTCHART project. "We began using radar data from Envisat's predecessor satellites ERS back in the early 1990s to update maps of French Guiana, in co-operation with the French military. Coastal changes occur very rapidly but satellites makes possible the easy updating of charts in a way that ships and aircraft cannot." 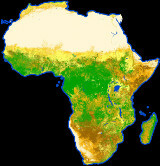 To qualify the COASTCHART system the plan is to map 6000 km of West African coastline covering 15 countries extending from Senegal to the Republic of Congo. ESA is partnering with European hydrographic organisations working in the region: Spain's Instituto HidrogrÃ¡fico de la Marina(IHM), Portugal's Instituto HidrogrÃ¡fico (IHPT), France's Service Hydrographique et OcÃ©anographique de la Marine (SHOM) and the United Kingdom Hydrographic Office (UKHO). Paper and digital map products of the entire coastline will be delivered to a scale of 1: 50000, with 14 key sites including harbours, maritime facilities and river approaches to be delivered to a very-high-resolution 1:15000 scale. 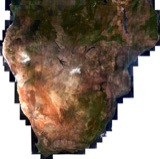 The project is making use of Envisat ASAR imagery, together with SPOT 5 optical imagery for precision mapping. The coastline is defined as the precise shoreline at the time of high water. This being so, the partner hydrographic organisations are supplying tidal data enabling satellite acquisitions to be planned to coincide with local high tides. For improved accuracy the findings will also be assessed against regional Digital Elevation Models (DEMs) that record topographic relief. The partner hydrographic organisations will also assist with interpretation and validation of COASTCHART results. "Participating in COASTCHART is a means of testing how well Earth Observation can meet our needs in delivering charting in this area," said John Pepper of UKHO. "Potentially space represents an extra source of information in areas where reliable and up-to-date information is at a premium. By capturing coastal information, we will better be able to deliver solutions to users both on shore as well as at sea." "For example, there is a growing interest in the detailed spatial mapping of coasts as a tool for environmental monitoring and managing marine resources, as shown by Europe fostering a major new strategy on Integrated Coastal Zone Management." Laurent Louvart of SHOM agreed: "There is a new appreciation of the need to accurately chart the coastal areas as well as inland territories. Environmental emergencies such as the Prestige oil spill in 2002 have underlined this. And with mean sea level rising it is crucial to document the part of the land that will be most affected by this development. "Earth Observation promises to be a cost-effective way of maintaining our charts, although it will supplement ground-based surveying, not replace it. The need for people on the ground is always there, because it is very difficult to interpret imagery without a ground presence." The â‚¬1 million COASTCHART project is being managed for ESA by LogicaCMG UK, and takes place as part of the Data User Element of the Earth Observation Envelope Programme. It is due to conclude in late 2006.